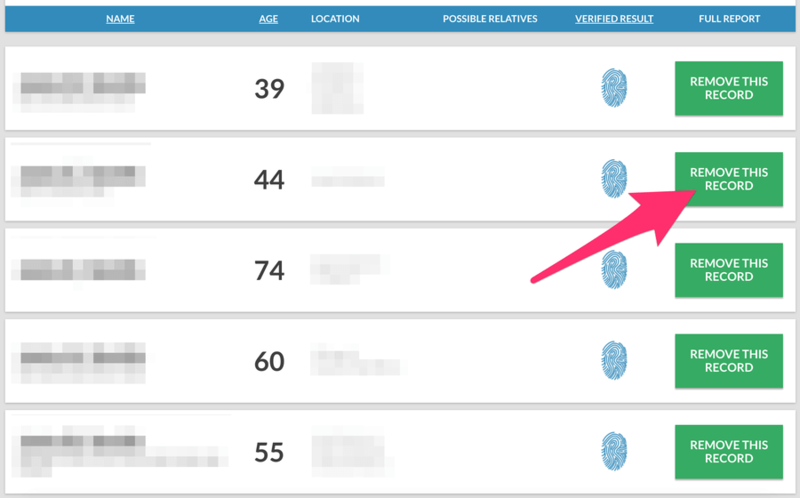 [New Update]: We just launched a new feature that will automatically opt you out of Instant Checkmate and 25+ other sites that share your info also. Click here to give it a shot. If you want to learn how to make it through the Instant Checkmate opt out process with no issues, you’ve come to the right place. This is one of the most requested sites we hear about, and there are a couple reasons for this. The first is that anyone can use the site to find sensitive information about you relatively easily. That might seem pretty bad, but it gets worse. Instant Checkmate is more aggressive with their marketing than pretty much all other people search sites. It’s not an exaggeration to say they plaster ads all over the internet. This means not only do they have sensitive information you don’t want people seeing, but they’re constantly encouraging others to find it. While most of their competitors grow or die organically, Instant Checkmate invests money to make sure their audience never goes away. This means that completing the Instant Checkmate opt out process is essential if you value your privacy. Before we cover the opt out steps you need to take, there’s a common question that we want to address. Understanding this will help you better protect your information in the long run. Did Instant Checkmate Break The Law By Collecting My Info? We hear this question all the time from people who are worried about their personal information being shared all over the internet. The reason for this is because it naturally feels a little bit unethical for this kind of info to be aggregated and viewed by other people. When you add the fact that Instant Checkmate aggressively advertises their site, it can leave you with a bad taste in your mouth. Despite this, it’s completely legal for them to do what they’ve been doing. You see, everything that you can find on Instant Checkmate can be found via public records in one form or another. These records exist and can be legally accessed by anyone. This is the way things have been since before the internet became the force it is today. What makes it different now is sites like Instant Checkmate can parse through these records and aggregate them on their site. This is just an extension of publicly accessible information that is already out there. If you were considering a legal angle when opting out of Instant Checkmate, you won’t get very far. So we hinted at this a little bit in the previous section, but let’s dig into it some more. 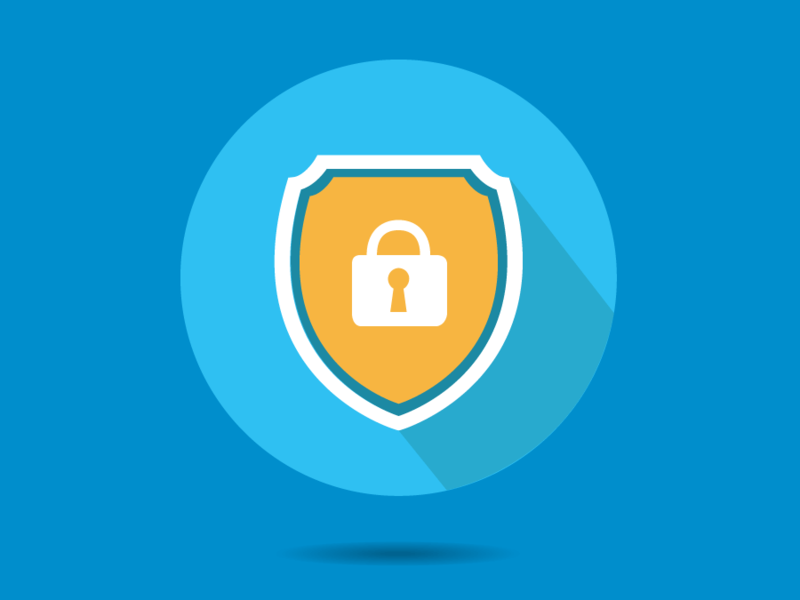 Understanding how this whole process works will make it easier for you to protect sensitive information about yourself, even after you’ve gone through the Instant Checkmate opt out procedure. Instant Checkmate is no different than any other people search site when it comes to how it collects your info. Honestly, they’re all pretty much the same site with different names. 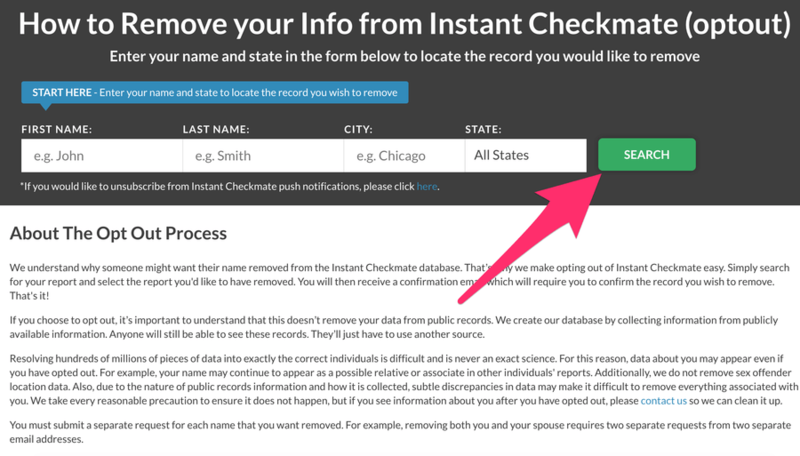 We’ve already established that public records are one of the main sources Instant Checkmate uses for finding info to share. You can walk into your local records office and find the same data. Now that everything is shared online, this can all be found there as well. This is the starting point for sites like Instant Checkmate. They use software to scrape and collect all of this information and add it to their site. They’re doing this 24/7 and unless regulations change (not likely) they’ll continue to do so. But there’s another way they collect your information, and you need to be aware of it. Instant Checkmate and similar sites not only scrape public records, but they scrape each other as well. It’s easier to establish a massive database of personal information when you don’t have to start from scratch all the time. If another site has pieces of information Instant Checkmate couldn’t scrape, they’ll use them as a source. It’s important because if Instant Checkmate has your info we can guarantee that it will be found on other sites as well. They’re essentially sharing your data with each other. If you want to opt out of Instant Checkmate and keep your info private, this is a massive issue. You can go through the entire Instant Checkmate opt out process successfully, and still have to worry about dozens of other sites. To make things even more enjoyable, there isn’t an easy way to manually check what these sites are. You basically have to guess and search through a bunch of different aggregators. Then once you find a site that has sensitive information about you, you need to go through their opt out process as well. The whole thing is just a massive pain. This is why we launched a new feature within our software that will do the searching for you. 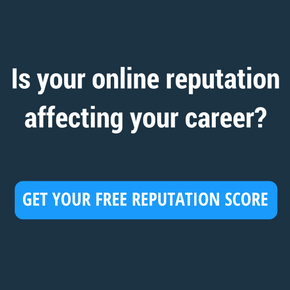 If you’re on any popular people search sites like Instant Checkmate, our software will find out and automatically remove you from them as well. Visit this page if you want to give it a shot. The easy answer is money, but let’s explore this a little more. Instant Checkmate needs to collect a significant amount of information in order to do business. A people search website without any people in the database doesn’t work very well. The more information they have on the site the better chance they have of convincing potential searchers to purchase a membership. Instant Checkmate pushes these far more aggressively than a lot of other sites, so if they don’t have enough data their growth will slow. They split up certain types of information in order to incentivize a premium membership. As you can tell, there’s a ton of information in the premium report that many people would pay for. This is why Instant Checkmate breaks these up into two groups. Since they’ve been around for a while we’re guessing that strategy is working quite well for them. Despite the frustrating reality that you’ve got to deal with opting out of Instant Checkmate whether you like it or not, there’s an upside. If you go through the Instant Checkmate opt out steps they legally have to honor it. This isn’t a rule that only applies to Instant Checkmate. It’s actually the case for all people finder sites out there. Unfortunately this information isn’t widespread, and it can change your entire outlook on how to approach this situation. Instead of trying removal methods that don’t work you can rest easy knowing things will be fine. Go through the steps properly, monitor the necessary channels, and you’ll be able to remove yourself from the site. If you want the most convenient and speedy option for opting out of Instant Checkmate, our new software feature is the way to go. Not only will it scan the web and find out what people finder sites have your information, it will also opt you out from them automatically. Here’s how to opt out from Instant Checkmate with our tool. This new tool that automatically opts you out of Instant Checkmate has been added to our current software. To use it hop in to your BrandYourself account. If you still need to create one you can do it here. 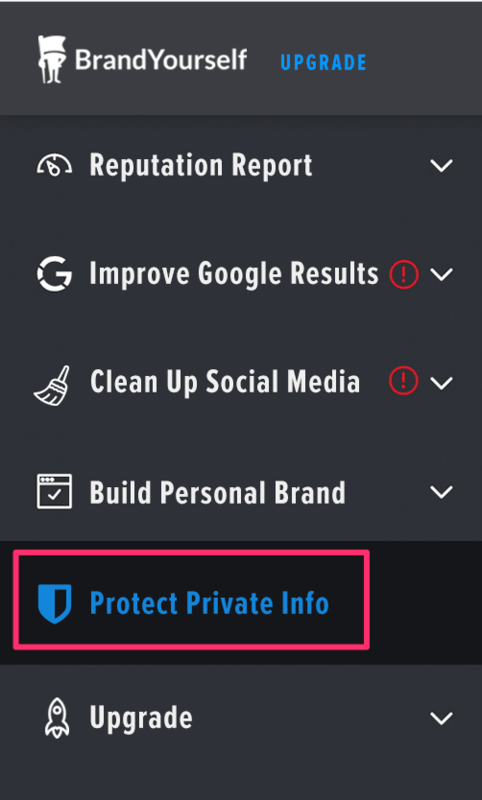 The feature is in a brand new section labeled “protect private info” and it can be found on the left hand navigation bar on your screen. Head over to that section to get started. This step is where everything happens, but it’s also super easy to complete. Just click the blue button that says “remove my private info” and sit back. The software will take care of everything. 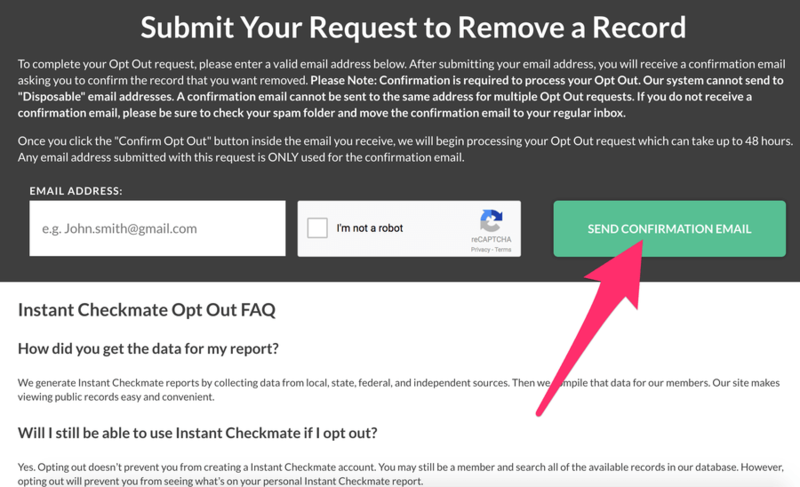 The Instant Checkmate opt out process will take a few weeks for the sites to comply with. It’s not immediate. This is par for the course for all people search sites. Before you begin the Instant Checkmate opt out procedure manually, you need to be aware of a few important points. Step 1: Visit Instant Checkmate’s opt out page here. This is the easiest way to access your listing. Step 2: Search your name and location to find the right entry for you. Their search feature is pretty straightforward so it shouldn’t be difficult to access your listing. Step 3: Find your listing and click the “Remove This Record” button. Once you find your listing click the massive green button that says “remove your record” to the right of it. Step 4: Enter your email address and click the “send confirmation email” button. Drop in your email address and request your confirmation email. Step 5: You’ll receive an email that lets you finalize the opt out request. If you don’t see anything in your inbox you should check your spam folder. Once you’ve found your email click the confirmation link and your information will be removed as soon as possible. They say this will happen within 48 hours but we’ve heard from people who said it took closer to a couple weeks. Even though you’ve gone through the Instant Checkmate opt out process, there’s still work to be done if you want to protect your personal information. As we’ve mentioned a few times, if your info is on Instant Checkmate it’s on other sites too. If you want to do things manually you’ll need to start sleuthing around to find out where it is. We recommend that you start by Googling yourself and making a spreadsheet of instances you find, then knocking them off all at once. If you don’t have the time to hassle with all of that, we highly recommend that you give our software a shot. It will take care of everything and free up your time so you can spend it on things that are actually fun.